Graham Burke celebrates his opener. 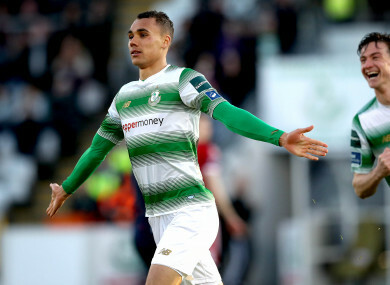 GRAHAM BURKE COULD have his own personal goal of the season reel at this rate, and it was another wonder-strike from Shamrock Rovers’ star man that set the tone in tonight’s 3-0 win over Cork City. With Ireland manager Martin O’Neill watching from the stands at Tallaght Stadium, Burke opened the scoring in sensational fashion before Ethan Boyle doubled their advantage, and Roberto Lopes added a third in the second half. Rovers, who were without a league win in five after drawing 0-0 with Derry City on Friday night, brought in Gary Shaw up front for Dan Carr, who was unavailable through suspension. That meant 18-year-old Aaron Bolger retained his place in midfield after impressing manager Stephen Bradley last time out. Kieran Sadlier and Garry Buckley were recalled to the City side — who got one over on main title rivals Dundalk three days ago — with Karl Sheppard and Jimmy Keohane both dropping to the bench. Former Huddersfield Town youngster Danny Kane made his league debut against the Lilywhites and did enough to be named again at left full-back. Burke, the Premier Division’s top scorer, has hit some stunning strikes already this season, and his ninth league goal of 2018 was right up there with the best. Three minutes hadn’t even been played when the 24-year-old let fly from distance and it nestled in the top corner. Rovers remained on the front foot in the first half with Aaron Bolger attempting a lob from long range and Burke shooting straight at McNulty. And they soon found a second, as Burke’s in-swinging corner was flicked home at the front post by Ethan Boyle. On 31 minutes, Garry Buckley should have got the visitors off the mark. A Sadlier free-kick found the midfield man completely unmarked at the back stick and he made decent contact with the volley but it was too close to Kevin Horgan, whose save was an excellent one. Horgan, the younger brother of Cork full-back Colm and Preston North End winger Daryl, has come in for much criticism this season, but he had to be at his best to maintain a clean sheet going in at the break. Graham Cummins struck the ball at the Rovers keeper, and he got down brilliantly to push Barry McNamee’s follow-up around the post. Drastic times call for drastic measures and City boss John Caulfield withdrew captain Conor McCormack and Kane at half-time to introduce Karl Sheppard and Jimmy Keohane into the mix. But it was Rovers who continued to create. Greg Bolger, facing his old club, got beyond Horgan and cut the ball back for Burke. Just as he was about to pull the trigger, however, Keohane put his body on the line to make a vital block, and Finn then blazed over. Sheppard looked lively and beat the offside trap to latch onto a long ball, but he couldn’t capitalise and Lee Grace recovered to prevent a goalscoring opportunity. Remarkably, Cork conceded a third on 61 minutes. Burke’s delivery from a free-kick was touched on by Joey O’Brien, and Lopes had an easy finish. With Dundalk hammering St Patrick’s Athletic 5-0 tonight, Stephen Kenny’s men sit top of the table — but only due to superior goal difference. SHAMROCK ROVERS: Kevin Horgan; Ethan Boyle, Roberto Lopes, Lee Grace, Joey O’Brien; Greg Bolger, Aaron Bolger, Sean Kavanagh, Ronan Finn (Brandon Miele 81), Graham Burke; Gary Shaw. CORK CITY: Mark McNulty; Colm Horgan, Conor McCarthy, Sean McLoughlin, Danny Kane (Jimmy Keohane 46); Conor McCormack (c) (Karl Sheppard 46), Gearoid Morrissey (Josh O’Hanlon 67); Barry McNamee, Kieran Sadlier, Garry Buckley; Graham Cummins. Email “Another Graham Burke wonder-strike sets Rovers on their way to stunning win over champions Cork ”. Feedback on “Another Graham Burke wonder-strike sets Rovers on their way to stunning win over champions Cork ”.